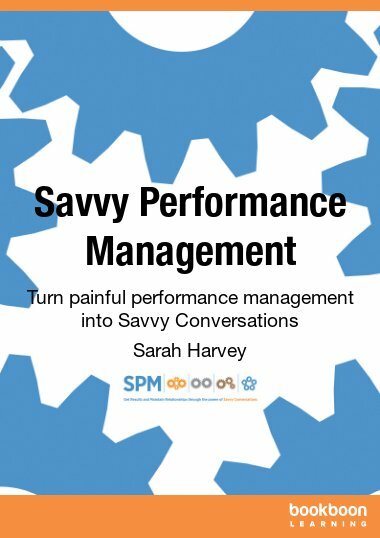 Sarah Harvey is an Organisational Development (OD) consultant, training facilitator and executive coach. With over 25 years experience of managing and leading people personally as well as working alongside managers and leaders at all levels, Sarah has experienced the highs and lows of managing people and performance from the perspectives of first line managers through to CEO’s and Board members. Her extensive practical experience has been gained through more than 10 years in senior Human Resources (HR) and leadership roles, followed by running her successful HR and OD consultancy, Savvy People Management Ltd (SPM), since 2003. Sarah holds a Post Graduate (Level 7) CIPD Diploma in Personnel Management and a Post Graduate (Level 7) ILM Diploma in Leadership Mentoring and Executive Coaching. Prior to setting up her own business, Sarah held a number of HR leadership roles. She was Business and Systems Manager for a large HR service at a time of transformational change and she has also led various cross functional/operational HR teams, Learning and Development services, shared services and data/analytics teams (HRMS). Sarah has been actively involved in volunteer roles with the CIPD, the professional body for HR and people development, for over 10 years. She was elected to the Membership and Professional Development Committee of the CIPD Board in 2012 and elected Chair of CIPD Sussex Branch in 2014. She was also Chair for South East Thames Branch, part of CIPD London from 2008–2012. Other voluntary roles include a 5-year term as a Trustee Board Member of a leading mental health and wellbeing charity. Established in 2003, SPM has an extensive track record of successful savvy assignments, helping clients large and small get maximum impact from their human resources and organisational development interventions. Sarah now specializes in working with individuals and teams using her unique Savvy Conversations concept and CREDS model. This shows clients how to get results and maintain relationships at work, whether the aim is to avoid conflict, plan for important conversations, give more effective feedback, carry out better quality 1-1’s, transform appraisal discussions, resolve differences of opinion or simply get the best from individuals and teams. Contact Sarah directly to find out more about her savvy business consultancy, training and coaching expertise and how she may support you in your business.